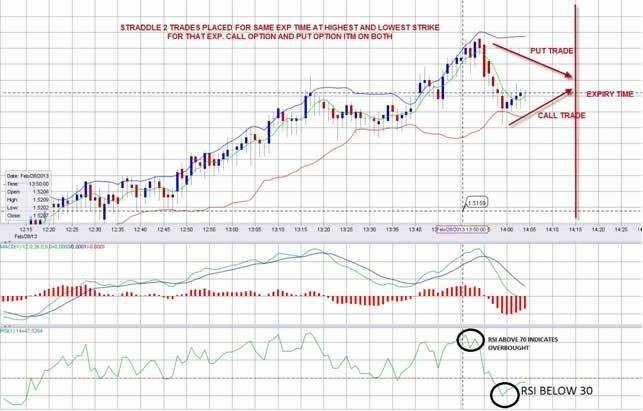 One trading strategy that is popular among binary options traders is the straddle strategy. When a trader experiments there will be a significant price movement, but will not go in which direction, this method is very appropriate to do. The strategy often referred to as this option is misunderstood as a hedging technique. , Straddle strategy is more appropriate as the use of both types of binary option reversal methods. As discussed in the previous article, the binary options reversal strategy can be divided into 2 parts, namely the reversal trend used to place an option on a trend reversal, and a risk reversal that places two opposite trading positions simultaneously. In this case, straddle binary options observe the top and lowest points of a trend before placing 2 options with the same expiry time. More specifically, the "put" option is placed at the strike price at the peak of the trend, while the "call" option is positioned at the strike price at the base of the trend. In using this strategy, traders are certainly required to be able to analyze the location of support and resistance in the previous price movements. The results of these observations are guidelines for determining the "put" and "call" option positions. Trader-determined support and ressistance levels can be imaginative ranges, which can give profit confidence if the price position is within range of the range when the expiry time expires. Because this strategy uses the highest and lowest points on a trend, finding these two levels can be the most difficult thing from using this strategy. If the determination is right, then trading will certainly end in-the-money because price movements can be predicted within the range range. However, incorrect estimates can cause prices to move out of range and cause one option to end out-of-the-money. When is the right time for Straddle's strategy? Straddle binary options are best done when the market has a stable volatility condition. That is, high volatility in certain instrument prices moves in an orderly manner, with the display of support and resistance levels in the same range. Thus, the price trend actually looks sideways despite high market volatility. Trading in this period is highly recommended if the two options you place are targeted to end in-the-money. If this method is done to anticipate losses, make sure that the expiry time you set can accommodate new trading positions. This method is done if you believe the previous trading position will fail, so that the second trading position will be able to reverse the possibility of loss from the first option. The suitability of straddle techniques for high volatility can be one of the binary options trading solutions. In one of the binary options trading tips, high volatility is a situation that is not recommended for traders binary options, especially for those who use a low expiry time limit. However, the condition of unpredictable price movements requires traders to be able to adjust their trading methods to various market situations. To overcome this, in addition to extending the expiry time limit, the straddle strategy can also be applied so that traders can place options even though market volatility is high. Because this strategy is first done by determining support and resistance levels, the first thing that comes to your mind is probably the use of the Fibonacci line. That method is one of several ways that can be used to apply this strategy. The "overbought" points from the RSI are when the price crosses the 70 level, while the 30 level marks the "oversold" limit. In the picture above, trader A initially places the "put" option for GBP / USD pair, because trading signals from the RSI indicator confirm "overbought" when the price crosses level 70. The expiry time selected at that time is 20 minutes. But the reversal from the "overbought" position turned out to be very aggressive and the price slid down to near level 30 when expiry time was still 15 minutes left. Some time before expiry time runs out, GBP / USD breaks level 30, or reaches its "oversold" position and experiences a reversal trend. Fearing that the option will end out-of-the-money when expiry time arrives, A then selects the option "call" at the strike price that shows an "oversold" position, with the expiry time limit ending with the previous "call" option. Thus, A has indirectly determined the price range for the 20 minute period. If GBP / USD then reaches the estimated price range when expiry time arrives, then both option A will end in-the-money, and the profit will also double. But if the price is outside the range, one option A will still end in-the-money. 1. Can trade binary options even though the volatility is high. If previously binary options traders are advised to choose market conditions with low volatility, traders can now use the straddle strategy to trade binary options even though market volatility is high. Noteworthy here is only the stability of the volatility, because if the price is very volatile but unstable, then determining the support and ressistance levels will be increasingly difficult to ascertain. 2. Keep profit wherever the market will move. Because the trading method for straddle binary options is done by placing the "put" and "call" options for the same expiry time, the trader profit will be more guaranteed when the price moves up or down. 3. Can increase profit opportunities and minimize risks. 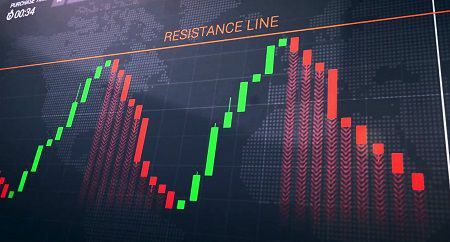 With an imaginative range of placing "call" and "put" options at support and ressistance points, traders can increase the likelihood of profit and minimize trading risk. If when expiry time the price is within the range, the profit can be obtained from both options, while the risk can still be minimized if the price goes out of range, because one option will still end in-the-money. 4. Shorten analysis time. Before opening a trading position, the trader will usually focus his focus on both technical and fundamental analysis. Not infrequently this activity becomes the main activity and is very time consuming. However, if a trader can place two options at the same time, then the trader is just looking for support and resistance levels. Traders also do not need to linger predicting the next price will go up or down, because the support and resistance positions can be used to confirm the price range in the span of time until expiry time arrives. Although straddle in binary options can provide more promising profits, there are things that still need to be considered before you use this strategy. Determining the level of support and ressistance is not an easy thing, especially if the line drawing can vary for each trader. If you are hesitant to use the Fibonacci line because of its subjectivity, there are still other ways that can be done such as using the RSI indicator or observing the formation of reversal trends. Fakeout and breakout are two things that can disrupt your analysis if you cannot anticipate it well. If you want the two options to end in-the-money, then you must be aware of the existence of fakeout (where the price seems to move through the support or resistance limits, but actually not) and anticipate a breakout (where the price really penetrates the support limit or ressistance). One of the most powerful ways to confirm these two things is to wait for the completion of the price pattern at the end of the time frame period you are using. For example, if you pay attention to the chart with a 15-minute time frame, then wait until the pattern is finished in one frame 15 minutes to be more sure if the price is experiencing a breakout or just fakeout. On the USD / CHF chart above, Ipin opened the "call" option at the support level, and placed the "put" when the price was confirmed unable to penetrate the ressistance level. The original trading capital of Ipin was $ 1000, with a return on profit of 75%. Ipin then uses the same trading size to place the second option while waiting for the expiry time to arrive. From the movement of the chart above, it can be seen that the price is within the limits of the Ipin trading range, so Ipin gets a payment of $ 3500, which is the result of the addition of Ipin's profit and capital. Thus, Ipin's total profit is $ 1500, or twice the return of $ 750 received if Ipin does not put the "put" option on the ressistance level. If one of Ipin's options turns out to be out-of-the-money, Ipin will still get $ 750 profit, because Ipin will only lose the initial capital of $ 1,000 from the failed option position, while the in-the-money option will generate a payment of $ 1750. From the results above, imagine if the trading size for the Ipin "call" option is greater. The profit achieved by Ipin will certainly increase. However, before increasing the amount of capital on one option, you must be absolutely sure if your choice is correct, because if it turns out the price moves in the opposite direction, the loss you receive will also be greater. Not all brokers allow their clients to place two options on one asset at the same time. Therefore, you must explore more information about the broker binary options that you use. If your broker allows the use of this method, then you can more freely practice this strategy. But if your broker prohibits it, you simply choose a longer expiry time to add a second option when the price moves against the forecast, so that both of your options can end at the same time. One thing that should not be forgotten in using the straddle binary options strategy is to practice on a demo account. Trial implementation strategies can ascertain whether this method suits your trading style. If you feel comfortable with this strategy on a demo account, then there is no other reason not to use the straddle binary options strategy.